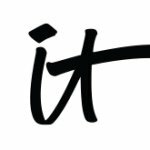 Living a Fit and Full Life: Prime and Prep Like a Pro with IT Cosmetics! Prime and prep like a pro with IT Cosmetics! 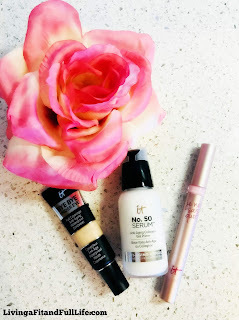 If you've been following my blog for awhile now, you'll know how much I love IT Cosmetics. I'm super excited to tell you about these three amazing products that will take you'r beauty routine to a whole new level. No. 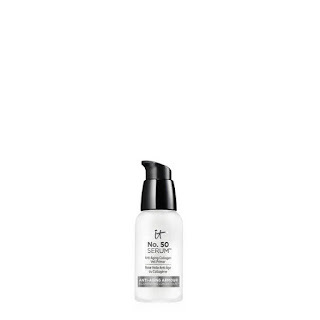 50 Serum™ Anti-Aging Collagen Veil Primer from IT Cosmetics is a must have in my makeup bag! It's an incredibly hydrating primer and serum in one, infused with more than 50 beneficial ingredients to nurture your skin and lock in moisture as it prepares it for flawless makeup application. I love how quickly it absorbs into my skin and how baby soft my skin feels after application. It creates a flawless base allowing your makeup to glide on with ease and look better than ever. 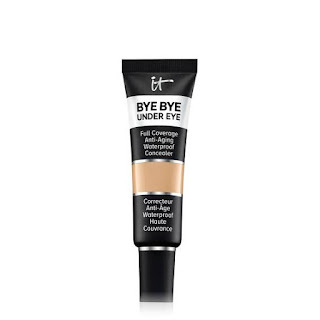 Bye Bye Under Eye is a full coverage anti-aging waterproof concealer that will have you looking bright eyed and bushy tailed! It you have dark under eye circles like me than you need to try this amazing product. As a mom of four it helps me look like I've had a full nights rest and keeps me looking young with its anti-aging peptides, vitamins, hydrolyzed collagen, hyaluronic acid and antioxidants. It's the most amazing under eye concealer that you just have to try! Je Ne Sais Quoi Lip Serum is a must have for lips! My lips always seem to be a dry mess but thanks to this amazing lip serum they're actually perfectly smooth and healthy. I don't know if its because I live in the desert, don't drink enough water or what but my lips always seem to be in need of something. This serum is infused with essential butters and oils, plus hyaluronic filling spheres and antioxidants to give your lips everything they crave and then some. I also love the added pink pigments to give your lips the perfect pink shade. This can be worn on it's own, or under other lip products kind of as a primer to help your lips look their best. IT Cosmetics has everything you need to prime and prep your skin and lips like a pro!